More pictures of the rumored Samsung Galaxy Note 8.0 have leaked, but so far they are leaving us with more questions than we had before. 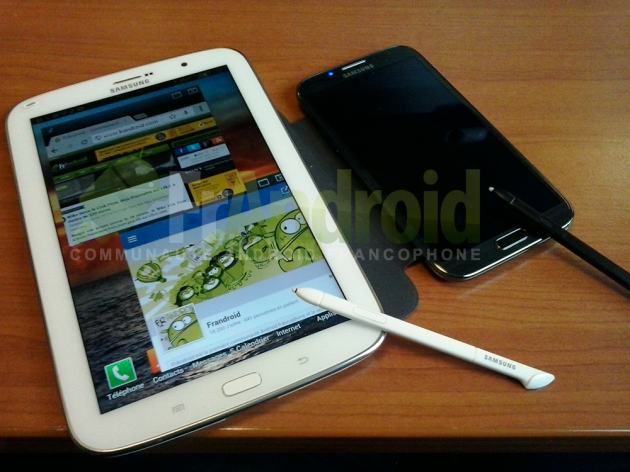 Mainly, where does this device fit in with the Note 10.1, Note 2 and the Galaxy Tab series? Shouldn’t the upcoming 7″ Tab 3 be enough? Another question: Samsung, do you really expect anyone to use this as a phone? It does have a telephone app in the bottom left corner, so try holding this to your ear and not getting made fun of. All sarcasm aside, it looks that this device will in fact be announced at MWC in a few weeks. The French site, Frandroid, got their hands on the device and reported the specs including a 1280 x 800 LCD display, Android 4.2 Jelly Bean, 2GB of RAM, a microSD card reader, cameras on the front and back, and a 4,600 mAh battery. Nowhere did they mention if it comes with a Bluetooth headset for those phone calls, but we sincerely hope it does. Is anyone interested in another Note at this point? No one will really make any phone calls on this, will they?